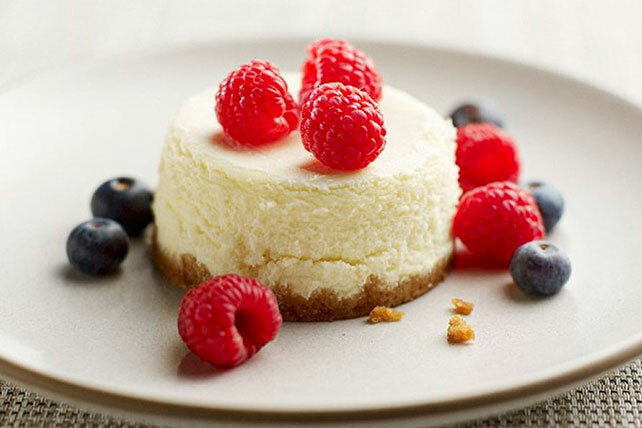 Prep this Mini Classic Cheesecake Recipe in 15 minutes. They're made in a muffin pan so baking a classic cheesecake recipe has never been easier. Mix graham crumbs and butter; press evenly onto bottoms of 12 muffin cups sprayed with cooking spray. Beat cream cheese, sugar and vanilla in large bowl with mixer until blended. Add eggs, 1 at a time, mixing on low speed after each just until blended. Pour evenly over crusts. Bake 20 min. or until center is almost set. Cool completely. Refrigerate 3 hours. With their built-in portion control, these luscious cakes make great treats.